This Yoga practice supply/tool is filled with Organic Buckwheat Hulls and has a velcro closure, so that hulls can be added or removed as needed. This also makes it easy to empty so that the whole pillow can be washed, dried and easily refilled. Perfect for massage therapists, acupuncturists, yoga practice or anyone who needs a little extra support in a small, easily portable size. Because Pillows are handmade, sizes may vary slightly. The pillows are sent overstuffed, so buckwheat can be remove to your desired firmness. 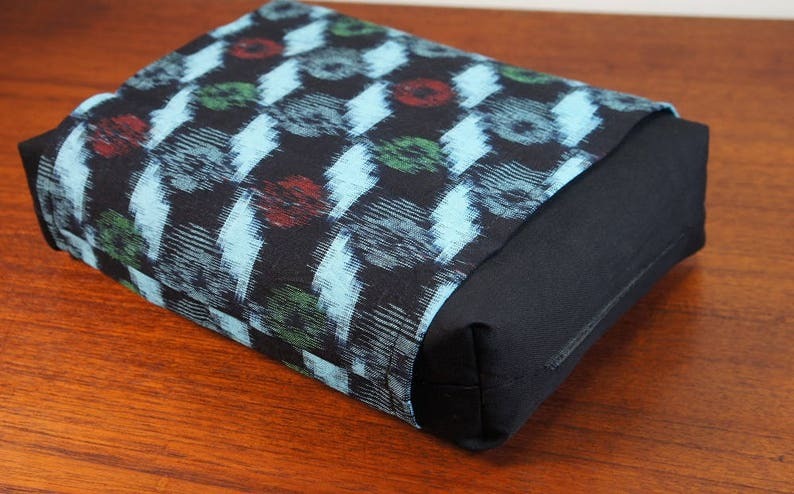 Pillow is made of a Black cotton/poly blend. Cover, 100% Cotton Vintage Japanese Kasuri woven with Light Blue (turquoise), Green and Red on a Dark Navy Blue background. Each Buckwheat Pillow is Handmade with Love in the USA. To wash: Remove Buckwheat Hulls; wash Pillow and Cover by hand in COLD water, Hang/Air dry, very LOW iron if needed. **Meditation cushion and eye pillow sold separately.